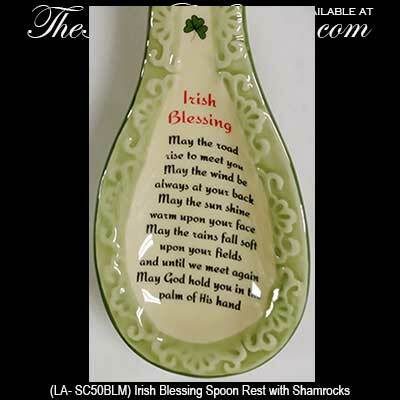 This porcelain spoon holder features the Irish blessing along with shamrock accenting. 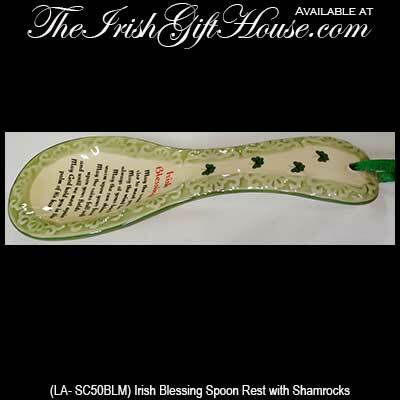 This Irish blessing spoon rest with shamrocks would make a great kitchen gift and it is complete with green ribbon for display. The Irish spoon holder is 9" long and 3" wide and features a green embossed design along the border. 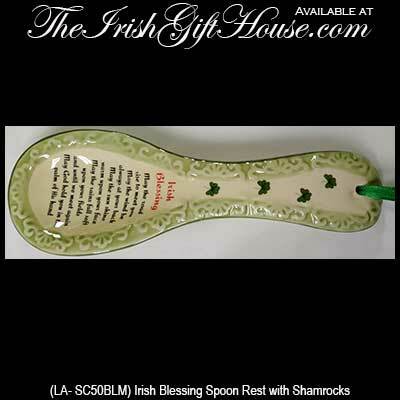 The Irish spoon rest is made in Ireland by Liffey Artefacts and it is gift packaged with a shamrock history card that is complements of The Irish Gift House. This porcelain Irish spoon holder features shamrocks. This porcelain Irish blessing spoon holder features a kitchen prayer along with shamrocks. This porcelain Irish spoon holder features the Claddagh along with shamrock accenting. This piece of Belleek dinnerware is a spoon rest that is enhanced with shamrocks.